We had a great and busy weekend once again. On Saturday, we drove out to Lindsey and Eric's house for a barbecue. It was our first time visiting their new home and we had a blast. Sweet P was a champ! Since Secret Recipe Club was coming up, I decided to pick out an appetizer from Juanita's Cocina to bring with us. 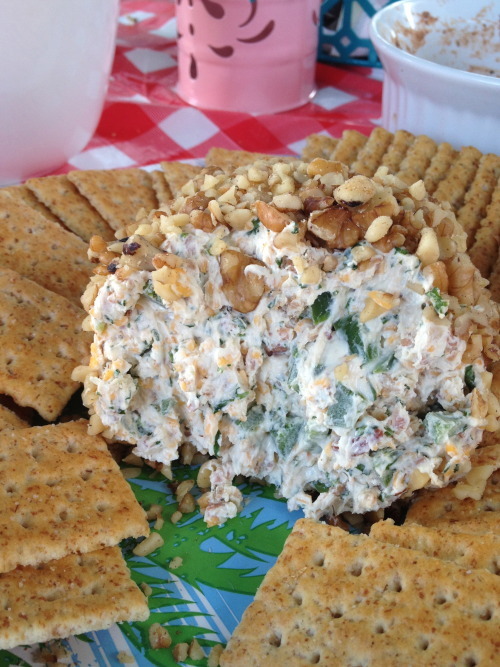 When I found this gorgeous and delicious bacon jalapeno cheese ball, I knew it would be the perfect party food to share. It was so good that I made it again on Sunday for a little belated birthday celebration at my parents' house. So many of Jen's recipes looked incredible (hello microwaved cakes in jars?!) but I'm so glad that I picked this recipe. By cleaning the jalapenos completely - removing each and every seed and rib - this cheseball had just the slightest kick with an otherwise peppery, bacony, cheesy flavor. And the best part? It came together very quickly with no baking required! In a bowl, mix together the cream cheese, cheddar, cilantro, garlic, cumin, lime juice, Worcestershire, diced jalapenos, and half of the crumbled bacon. Season with salt and pepper. Once completely combined, shape into a ball, wrap with plastic wrap and place in the refrigerator for 15-30 min. When firmed slightly, roll in chopped nuts until completely coated. Serve with crackers, or your choice of dippers. What are your go-to party foods? 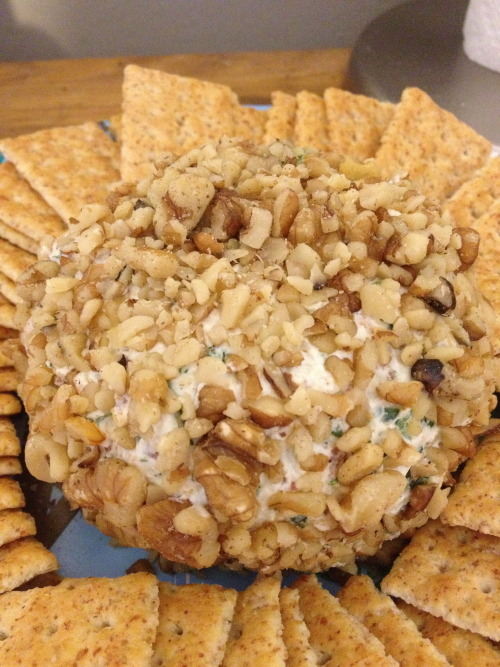 This cheese ball is going to be my new go-to!